Ten years ago, amnesiac Guy Rowland hired a private investigator to figure out who he was and where he came from. Soon afterwards, the PI gave Guy a new identity and a job as the PI’s assistant, saying that sometimes it’s best not to remember who you are. But now that his good friend and employer has retired, Guy again begins his search for identity. Reading this book made me understand why Modiano won the Nobel Prize in literature. The prose was almost poetic, and the imagery was gripping. For instance, he found a drained, emotionally dying clue to his past in a run-down bar. The whole chapter was filled with coffin and morgue imagery, complete with an “embalmed man” who observed everything, no matter how stimulating, without blinking an eye. 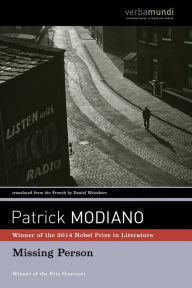 All of Modiano’s chapters were set up in this way – with vivid imagery fitting the clue that he had found – though the imagery was always dark and mysterious. Unsurprising for a book about amnesia, the over-arching theme of the story was identity. Who am I? Does my past change who I am? These questions are explored as Guy’s own vision of who he is transforms as he gets more clues. We can only wonder at the end if he’s really found his real self, or if he’s just adopted the identity of a man who fits the person Guy wants to be. I definitely urge you to read Missing Person. I hope I find the time to read more Modiano in the future.